car via the dashboard on the Third Mainland Bridge in Lagos. 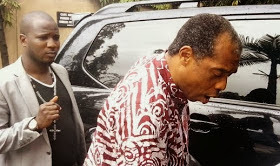 Femi Kuti narrated his ordeal jokingly at MUSON Center's pre-event news briefing. The Afrobeat King said he was horrified by the event. was at top speed, starring at him snappily before ducking away. a joke of the situation. am, I can't joke with it." The crowd roared with laughter. the lizard got into his car.